B&M Kickdown Kit - Pann Auto Performance - San Diego largest aftermarket automotive performance parts - What do you drive? TH-700R4 transmissions will downshift from fourth to third gear anytime there is more than about half throttle (except Corvette and some H.O. Camaros and Firebirds). As a result, it is impossible to cruise at high speeds in overdrive (fourth) gear. 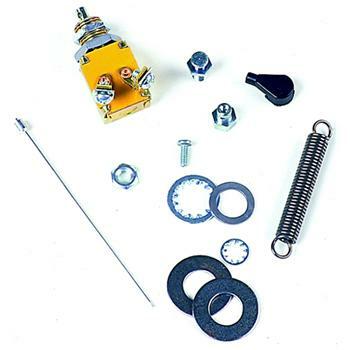 This kit prevents a forced part throttle kickdown from fourth to third gear, and allows cruising at higher speeds in overdrive. The transmission will only kick down from fourth to third gear at 3/4 throttle. When swapping the TH-400 into any vehicle, this kit makes installation of the transmission kickdown feature a snap. Mount to either a TH-700 or TH-350 throttle cable bracket.